The federal government's National Highway Traffic Safety Administration is taking a closer look at self-driving cars. The agency released a set of proposed rules and regulations for autonomous vehicles Thursday while, at the same time, announcing plans for its own research programs looking into self-driving technology. NHTSA recommends that states issue separate driver licenses, or at least special driver license endorsements, for those who wish to operate autonomous vehicles. These special licenses or endorsements should be given only after someone has completed a training that would cover such things as how and when to take over control of a vehicle. NHTSA also recommends that states require automakers that wish to test self-driving vehicles share information about all incidents and crashes. "Whether we're talking about automated features in cars today or fully automated vehicles of the future, our top priority is to ensure these vehicles -- and their occupants -- are safe," said Transportation Secretary Ray LaHood. NHTSA is part of the Department of Transportation. Currently, California, Nevada and Florida have specific legislation allowing automakers to test self-driving vehicles on roads in those states. Those laws require a licensed driver to be seated at the controls even when the vehicle is driving on its own. "NHTSA does not recommend that states authorize the operation of self-driving vehicles for purposes other than testing at this time," the agency said in its statement. "We believe there are a number of technological issues as well as human performance issues that must be addressed before self-driving vehicles can be made widely available." NHTSA defines five stages of self-driving vehicles ranging from "Level 1," in which the vehicle's computer-operated systems can assist in emergency situations. Cars like this are already available. In fact, "electronic stability control," in which a car automatically uses rapid brake pulses at individual wheels to help a driver maintain control during a potential skid, is now required on all new cars. Other features that would fall under this definition include automatic braking in the event of an impending collision, something that is offered on many luxury cars. "Level 2" is something like today's "active cruise control" in which the car can take over mundane, non-emergency driving tasks such as maintaining a speed and keeping a safe distance from cars ahead. The driver is expected to be ready to take control quickly in an emergency and for more complicated driving situations. The next generation of Mercedes-Benz large S-class sedan will take active cruise control to another level by allowing to steer itself to some extent. Google's so-called self-driving car, in which a driver is expected to be seated at the controls and expected to take over driving at times, is described as a "Level 3" vehicle. The most advanced system envisaged by the agency, "Level 4," would be one in which a driver only inputs a desired destination but is not expected to take any active role in driving the vehicle at any time. Vehicles that take autonomous driving to this level are not yet close to being publicly available, the agency said. 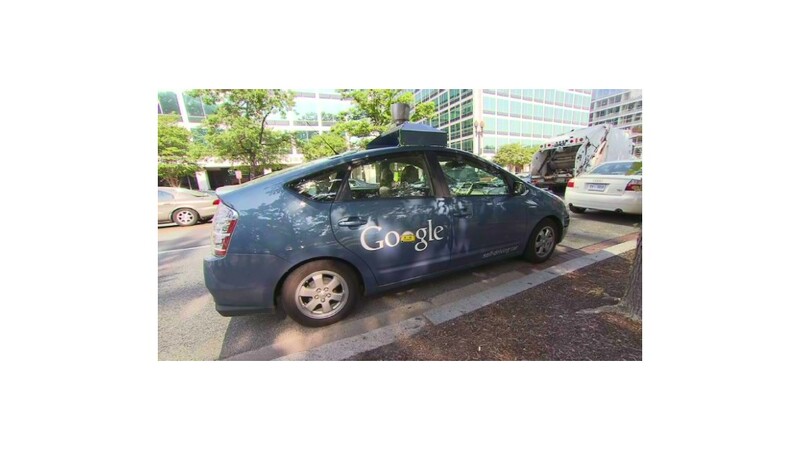 Besides Google, major automakers including General Motors (GM), Toyota and Audi are researching self-driving cars. NHTSA is also researching various aspects of self-driving cars including looking into the best methods of alerting drivers to malfunctions or emergency situations. The agency has also, for some time, been involved in research into "vehicle-to-vehicle" communications. These systems allow vehicles to send data to one another using radio signals. In that, vehicles can be warned of impending maneuvers by other vehicles and can also be instantly alerted to possible hazards ahead. Self-driving cars are seen as having the potential to save many thousands of lives annually by avoiding deadly crashes caused by human error, the reason for the vast majority of auto accidents.